ROSEBURG, Ore. -- The 26-year-old gunman who opened fire on fellow students in his community college English class, killing nine people, was an Army boot camp dropout who studied mass shooters before becoming one himself. A day after the rampage in this Oregon timber town, authorities said Christopher Sean Harper-Mercer wore a flak jacket and brought at least six guns and five ammunition magazines to the school. Investigators found another seven guns at the apartment he shared with his mother. Officials on Friday also released the names of the dead, who ranged in age from 18 to 67 and included several freshmen and a teacher. They were sons and daughters, spouses and parents. 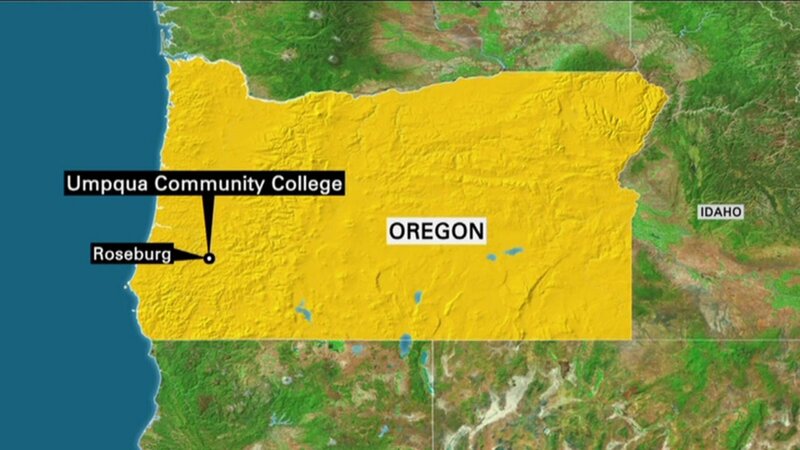 Seven other people were wounded in the attack in Roseburg, about 180 miles south of Portland. Harper-Mercer, who died during a shootout with police, was armed with handguns and a rifle, some of which were military grade. The weapons had been purchased legally over the past three years, some by him, others by relatives, said Celinez Nunez, assistant field agent for the Seattle division of the Bureau of Alcohol, Tobacco and Firearms. Oregon's top federal prosecutor said the shooter used a handgun when he opened fire on classmates and stashed a rifle in another room and did not fire it. He says it's impossible to know what the shooter had planned for the rifle. Those who knew the shooter described an awkward loner. Harper-Mercer's social media profiles suggested he was fascinated by the Irish Republican Army and frustrated by traditional organized religion. He also tracked other mass shootings. In one post, he appeared to urge readers to watch the online footage of Vester Flanagan shooting two former colleagues live on TV in August in Virginia, noting "the more people you kill, the more you're in the limelight." He may have even posted a warning. A message on 4chan - a forum where racist and misogynistic comments are frequent - warned of an impending attack, but it's unclear if it came from Harper-Mercer. "Some of you guys are alright. Don't go to school tomorrow if you are in the northwest," an anonymous poster wrote a day before the shootings. On Thursday morning, he walked into Snyder Hall at Umpqua Community College and began firing, shooting many victims repeatedly. Survivors described a classroom of carnage, and one said he ordered students to state their religion before shooting them. Students in a classroom next door heard several shots, one right after the other, and their teacher told them to leave. "We began to run," student Hannah Miles said. "A lot of my classmates were going every which way." Several years ago, Harper-Mercer moved to Winchester, Oregon, from Torrance, California, with his mother, a nurse named Laurel Harper. His father, Ian Mercer, originally from the United Kingdom, told reporters outside his Tarzana, California, home, "I'm just as shocked as anybody at what happened." Army spokesman Lt. Col. Ben Garrett said Harper-Mercer was in the military for a little over a month at Ft. Jackson, South Carolina, but was discharged for failing to meet the minimum standards. Garrett did not say which standards Harper-Mercer failed. Generally, the Army requires recruits to pass physical fitness tests and to be in generally good physical and mental health. Recruits must also pass a multiple-choice test covering science, math, reading comprehension and other topics.